I Found a Conch Pearl -- Yeahhh!! Have You Found a Conch Pearl? Have you ever found a conch pearl? Or maybe you've found several conch pearls. Here is a fun place for you to share your photos and stories of finding these lovely natural pearls. The pearls are generally found embedded in the flesh of the mollusk; quite often they are in a sac or cyst with an external opening form which they are sometimes dislodged by the muscular movement of the animal. The yield is small, a thousand shells in many cases yielding only a very small number of seed-pearls or perhaps none at all. Most of them are oval, commonly somewhat elongated. The usual size is about one grain in weight, but some of them weigh over twenty, and a very few exceed fifty grains each. These pearls are generally of a deep pink color, shading toward whitish pink at each end. While this is the usual color, yellow, white, red, and even brown conch pearls are occasionally obtained; these are not so highly prized as the pink ones. Conch pearls present a peculiar wavy appearance and a sheen somewhat like watered silk, a result of the reflections produced by the fibrous stellated structure. The value of conch pearls is as variable as their form, color, and size, and they are sold by the fishermen for a variety of prices which range quite high for large ones with exceptional form, color and luster. Have you ever found a Conch Pearl? You are invited to share you story about finding a conch pearl. Read about other conch pearls found! I don't speak English very well, I found a pearl inside a conch and I want to sell it. 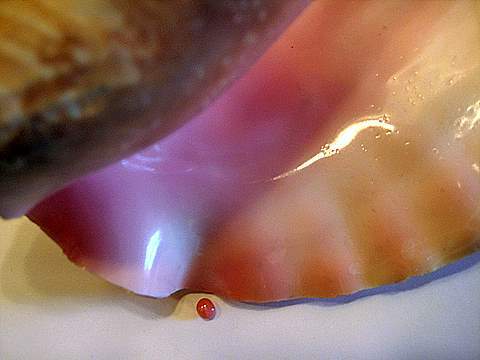 Learn more about conch pearls after this found a conch pearl page.